Police have contacted the Football Association over an admission by former England striker Matt Le Tissier that he was part of a failed betting scam. In his autobiography, Taking Le Tiss, he admitted gambling on the time of the first throw-in in Southampton's 2-0 win at Wimbledon in April 1995. Police said they are discussing the matter with the FA. 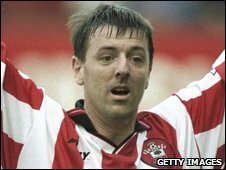 Former Southampton captain Le Tissier said he had not been contacted by officers and did not want to comment. Hampshire Police said the matter was still in its early stages and was not yet a formal investigation. A spokesman added the matter was taken up by a senior officer following extensive publicity in the media. In a statement, police added: "Police in Southampton have been made aware of a historic spread betting scam allegation at a Southampton football match in the 1990s. "We have raised this matter with the FA and are discussing it with them." A spokesman for the FA confirmed police had been in touch and added: "We will consider what action to take, if any." In his autobiography, 40-year-old Le Tissier said he tried to kick the ball out of play, but it was kept in by Neil Shipperley, who was unaware of the bet. As Southampton captain for the Premier League game, Le Tissier was able to persuade his Wimbledon counterpart to let the Saints kick off in exchange for letting the Dons kick towards their own fans, he said in the book. "It seemed to be going like clockwork," said Le Tissier. "We kicked-off, the ball was tapped to me and I went to hit it out towards Neil Shipperley on the left wing. "As it was live on television, I didn't want to make it too obvious, so I tried to hit it just over his head. "But, with so much riding on it, I was a bit nervous and didn't give it enough welly. "The problem was that Shipps knew nothing about the bet and managed to reach it and even head it back into play." Le Tissier, who made more than 500 appearances for the Saints, then explained that the longer the ball remained in play, the more money he stood to lose. "I have never run so much in my life," said Guernsey-born Le Tissier. "Suddenly it was no longer a question of winning money." The ball eventually went out of play on 70 seconds, meaning Le Tissier neither won nor lost money. Southampton then went on to win the game, with Le Tissier scoring the first of their two goals. "I've never tried spread betting since," he concluded. Southampton FC declined to comment on the matter.